As the popularity of Jiu-Jitsu grows there is an influx of the need for Jiu Jitsu performance training and consequently physical therapy. I am currently a purple belt at American Top Team and I train at their East Orlando location under black belt Jayson Patino although I have teachers everywhere. I have been approached by many athletes looking to train their bodies and mind for improved Jiu Jitsu performance. A good Jiu Jitsu program should consist of exercises to balance the body anatomically, improve performance and response of muscles for that given practitioners style, address cardiovascular concerns depending on the demands of the practitioners’ competition and prepare the mind for competition and training. 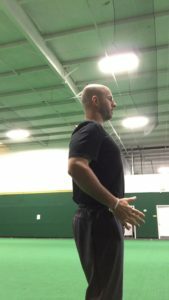 Given my background in physical therapy and athletic training, I always look to improve performance but at the same time balance the body and train the body functionally for it to move as it was intended. Jiu Jitsu by nature is a combat sport where one person tries to force another person to lose the will to fight by way of joint manipulation and or suffocation/choking. This martial art/sport is unique as it is practiced both standing up as well as on the ground in various positions. Similar to sports like football there are many different types of Jiu Jitsu practitioners who have very different styles and thus needs for training. Depending on the type of Jiu Jitsu practitioner and the style of fighting; he/she will develop certain anatomical compensations and therefore will present as such. 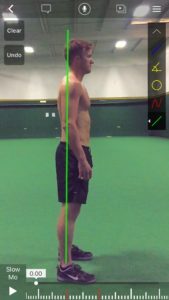 Before starting any training regimen it is very important to go through an anatomical analysis to have a record of compensations and imbalances in the body. I know what some of you may be thinking. My body feels good, I am not injured, I don’t have any imbalances. The truth is, if you cannot perform the same sweep or submission equally on both sides of your body, then you have imbalances and compensations anatomically. Therefore your training programs should be designed to increase performance as well as balance the body. This decreases the potential for injury by allowing for normal function of muscle tension relationships and joint movement. 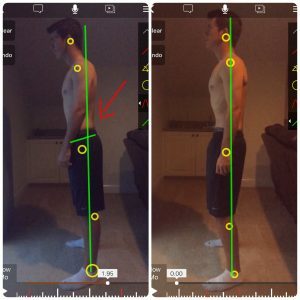 Addressing your posture is the first step in this process as posture is a visual road map of compensations in the body. Given the nature of Jiu Jitsu a lot of positions are done in the hip flexed position such as the closed guard, butterfly guard, battle position etc. This causes a tightness in the hip flexors and has many ramifications on our postures and body. You can see here how the hips and shoulders have shifted forward on the ankle line. This is a typical compensation on many humans and Jiu Jitsu practitioners. The second aspect of the training program is sport specific training. 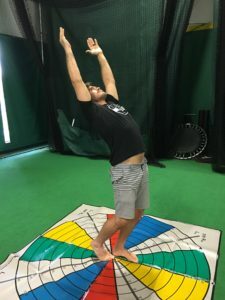 This may contradict some of the balancing work that you do but in my opinion still can and must be trained to allow for increased strength and performance in the specific activities of the practitioner. This may be grip work, explosive chest work, leg strength or muscular endurance. When doing this work, you must make sure to do something to offset the adaptations that may occur from the exercises so the athletes body is left balanced and will still gain the benefits of the intense specificity training. The cardiovascular component of training must also be addressed. You want to be sure you are prepared to perform at your max for the duration of your bout. Depending on the competition it may be one 4-6 minute round or perhaps one 20 minute round as in the new EBI (Eddie Bravo Invitational) format. If you are training MMA perhaps it is three to five, 5 minute rounds. Regardless, you want to be able to perform based off of your competitions rules. So you may want to set up circuits of exercises reflecting these time frames with appropriate rest times in between. Training in this manner will adapt your cardio vascular to the demands of the given competition. Remember to always train a little harder or longer then the allotted time as the adrenaline and competition usually utilizes more energy then training. The last and possibly the most important aspect of training is having a balanced and congruent mind. We have three levels to our brain; an unconscious, subconscious and conscious brain. If these three brains are in alignment our bodies are more apt and capable to perform as we would like it too. If these brains are not in alignment, meaning our subconscious mind is not in alignment with our conscious intentions we can possibly have nervousness, unplanned physiological processes, self sabotaging etc. The first step in achieving a sound mind and focused intentions is to set SMART goals. A Harvard University study on goal setting showed that having concrete, written and dated goals proved to bring success at a much higher percentage. 3 percent of the people in the study had concrete written, specific and dated goals and they were successful at meeting there goals 89% of the time as opposed to other groups who were successful sporadically to 30% of the time. After having concrete goals it is important to ensure we are subconsciously congruent with these goals. One excellent protocol that can accomplish this is Neuro Emotional Technique or N.E.T. To see more information on NET and read research studies visit www.NETMINDBODY.com Once you have focused goals, you must explore the WHYS? The WHYS are the reason you are training. If you have clear WHYS’ you will never have to question the reason you put yourself through training. Your whys can be anything; from feelings of success, relief of stress to monetary things. It is also very important to have clear action steps of exactly what you have to do to achieve your goals. Planning training days, nutrition, sleep etc, can go a long way in organizing your thoughts and focusing your intentions. Just as important as the action steps is exploring the possible obstacles that can impede you from achieving your goals. Knowing what can stop you from achieving your goals is just as important of knowing what you need to do. There are numerous other mental training drills and philosophies that can improve the practitioners mind for competition. In conclusion it is very important to have a well rounded training regimen for competition in Martial Arts and Jiu Jitsu. This should be specific to the type of competition, the style of fighting/training and also to avoid injury. Training the mind is a huge component of a good regimen and can be the difference in winning or losing. Functional 3-D testing with Tarsis Paula looking at hip mobility and the anterior fascial pathway flexibility. Working on a neutral spine and posterior pelvic till while in hip extension. 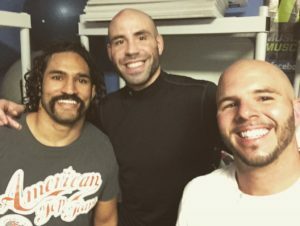 After a good session with Jayson Patino and Ben Saunders. President, New Dimensions Wellness Inc.